Robotics and autonomous systems are championed as one of the UK government’s ‘Eight Great Technologies’. 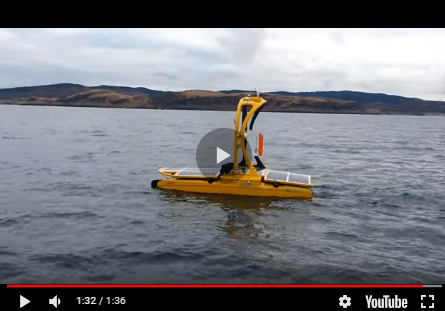 The National Oceanography Centre is committed to maximising this technology to further ocean science and has purchased a fleet of innovative autonomous surface vehicles, each with different specifications and capabilities. The fleet – including custom-designed vessels — was put through its paces late last year in an ambitious project. The first results from this mission have been revealing, with each vehicle proving it has a part to play in the future of autonomous research. When it comes to ocean exploration and discovery, the potential of new generation ocean robots is only just beginning to be explored. In 2013, the UK government made a commitment to robotics and autonomous systems, naming them as one of the ‘Eight Great Technologies’. In the same year, the National Oceanography Centre (NOC) further enhanced its investment in robotics. The organisation, which already owned a range of robotic vehicles including underwater gliders, AUVs and ROVs, purchased a Liquid Robotics SV3 Wave Glider. NOC and the Defence Science and Technology Laboratories (DSTL) had also co-funded a government-backed competition for UK commercial companies to design and develop new unmanned surface vehicles (USV). NOC purchased the two winning designs - the C-Enduro and the AutoNaut - which are very different in look and feel, but complement each other and offer enormous capability for ocean exploration and data capture. With its new fleet of diverse robot equipment now in place, the next step for NOC was to better understand the different capabilities of these vehicles and how they perform in a real-life ocean environment, with all the challenges that brings. The NOC’s ‘Exploring Ocean Fronts’ project was born. A highly-ambitious, multi-partner project, its aim was to test the capabilities of different types of vehicles, including the three USVs and two Slocum gliders and how they work together as a fleet. A distinctive vehicle, C-Enduro was designed and built by ASV, based in Portsmouth, UK, with additional offices in the USA (Houston, TX and Brousaard, LA). Measuring 4.2m in length and 2.8m high (including the mast), the catamaran shaped vehicle is built with a rugged carbon fibre, self-righting hull. Fully-loaded, the vehicle weighs 500kg with a draft of 0.4m and features a drop keel for sensor payloads. C-Enduro is twin propeller-driven and has solar panels, a wind-powered generator and a diesel generator, enabling the vehicle to travel at a speed of up to 7 knots. A fast-moving C-Enduro can remain at sea for 60 days and can operate in strong tidal streams and where quick transit is required. It has a large payload capacity and carries GPS, an AIS receiver, a depth sounder, Airmar 150WX and CTD sensors. It is also equipped with a winch for lowering CTDs and other instrumentation. With a shape reminiscent of a canoe, AutoNaut has been designed and built by MOST (Autonomous Vessels Ltd), based in West Sussex, UK. It is propelled by wave power, with its payload powered by a solar-charged battery and a methanol fuel cell. AutoNaut weighs approximately 120kg and is 3.5m in length, with a draft of 0.3m. It is composed of a single unit that has foils attached directly to the hull, making it easy to launch and recover; it can be launched from a slipway, towed out to the waves and remotely piloted via satellite. With an average speed of around 2-3 knots, it can stay at sea for long durations - more than 3 months at a time - and can cover 500 miles in a week and keep station on a 35 metre radius. As a base payload it carries an AIS receiver, CTD sensors and an AirMar 150WX weather station to measure air temperature, wind speed and direction. It can also attach a towed array for passive acoustic monitoring. For this mission, a radar transponder was fitted to augment the AIS based collision avoidance system. An auxiliary electric power pod is fitted for calm weather. NOC operates two versions of Liquid Robotic’s Wave Glider. Developed in Hawaii and with a design reminiscent of a surf board, they are split into two sections with a float and a sub-unit. Wave Gliders have a large payload capacity and both versions carry an AIS receiver, a weather station and water speed sensor. The SV2 model of the Wave Glider is just over 2m in length, weighs 89kg and travels through the water at an average of 1 knot. Its sub unit is suspended 5.8m below the main float and it is powered by waves, while its payload is powered by solar-charged battery. It carries an Echomax radar target enhancer. The larger SV3 model of the Wave Glider weighs 150kg, with its sub unit suspended 4m below the main float, which is just over 3m in length. It can remain at sea for up to 1 year and has a maximum payload weight of 45kg. It travels through the water at an average of 1.8 knots and is primarily powered by waves, but also includes an electric thruster for increased flexibility. In addition to the on-board equipment, all three of NOC’s USVs can carry surface-mounted Go-Pro cameras to take video images and stills far out into the ocean. In October 2014, after months of planning, the date for the first ‘real-life’ trial of the NOC’s new USVs had arrived. Coordinated by the Marine Autonomous Robotics Systems (MARS) team at NOC, the ‘Exploring Ocean Fronts’ project was wide-ranging and involved twenty partners from the public, private and academic sectors. Designed to test the capabilities of the ocean robots to work together as a fleet, they undertook two separate and distinct ocean-going tasks. Phase One saw AutoNaut, C-Enduro and both types of SV Wave Glider deployed from the Isles of Scilly and Cornwall along with two Slocum gliders. The robots were tasked with travelling through ocean fronts collecting data on the physical properties of the ocean environment and marine fauna, including plankton and marine mammals. Their journeys were piloted remotely, and their performance monitored from a central operations centre at the NOC in Southampton. During the carefully coordinated deployment, between them, the vehicles travelled over 150km from land over 20 days collecting a large volume of scientific data. The mission was made significantly more challenging by the arrival of a major storm which tested the abilities of the different vehicles to operate and respond in adverse weather conditions, including 6m (20 foot) high waves. As expected, the project confirmed that the different marine robots each excelled in slightly different ways. During phase one, the AutoNaut was piloted along fixed trajectories and successfully travelled in and out of the front while towing a 25m long passive acoustic array. It covered 630km through the water at an average speed of 1.2 knots collecting a range of data, and proved to be a very effective performer at relatively slow speeds in the open ocean. C-Enduro completed transects around the Scilly Isles, demonstrating strong capabilities in coastal waters aided by its power source. It also demonstrated its endurance potential and effectiveness in strong tidal streams where higher speeds are required. The Wave Gliders excelled at keeping tightly to their designated track and operated well in deeper water. Although all vehicles worked well the real benefits were seen in the large combined fleet operations. Having multiple vehicles in the water all sampling one large ocean feature increased the situational awareness and enabled rapid re-tasking of individual vehicles to optimise the survey. A month later, phase two of the project took place with a very different focus: testing the vehicle fleet in coastal waters, tracking 85 tagged fish released into a Marine Protected Area (MPA). In a trial coordinated by the Marine Biological Association, the C-Enduro, the SV3 Wave Glider and AutoNaut were equipped with fish tracking acoustic receivers, and were deployed alongside a fixed seabed sensor array to form an integrated system for tracking the movement of the tagged fish. The fixed array provides long term monitoring of fish movements at set points while the moving robotic vehicles periodically monitor the gaps between the fixed arrays. This integrated system approach has the potential to significantly reduce the operational overhead of tracking the fish, and provides a step change in data quality. To date, the initial results have been encouraging and have aptly demonstrated the benefits of using these robotic vehicles as part of an integrated measurement system. Well over 100 fish detections were made using the vehicles across a wide area, and provided near real-time tracking of the fish. In addition, through both phases of the project, all three vehicles demonstrated their potential for monitoring the ocean using on-board cameras, recording some impressive and revealing photographs and footage. Almost 4000 images were captured along with additional time-lapse video footage, providing valuable snapshots of ocean life. They featured storm images and photographs of marine litter, weed mats and marine life, including gannets and a harbour porpoise. In 2015, the success of the ‘Exploring Ocean Fronts’ project is still being evaluated, along with the capabilities of the different USVs involved. The findings from both phases are being used by all organisations involved to shape future uses for the marine robots and also to develop and refine the technology itself. It is an exciting era. As the UK government continues to champion autonomous robotics, NOC will continue to push the boundaries of autonomous exploration of the ocean, learning lessons and making new discoveries about the technology along the way.